My initial reaction to The Four Burners Theory was to search for a way to bypass it. “Can I succeed and keep all four burners running?” I wondered. Maybe I could combine health and work. “I hear sitting all day is unhealthy. What if I got a standing desk?” Now, I know what you are thinking. Believing that you will be healthy because you bought a standing desk is like believing you are a rebel because you ignored the fasten seatbelt sign on an airplane, but whatever. Soon I realized I was inventing these workarounds because I didn’t want to face the real issue: life is filled with tradeoffs. If you want to excel in your work and in your marriage, then your friends and your health may have to suffer. If you want to be healthy and succeed as a parent, then you might be forced to dial back your career ambitions. Of course, you are free to divide your time equally among all four burners, but you have to accept that you will never reach your full potential in any given area. Essentially, we are forced to choose. Would you rather live a life that is unbalanced, but high-performing in a certain area? Or would you rather live a life that is balanced, but never maximizes your potential in a given quadrant? What is the best way to handle these work-life balance problems? I don’t claim to have it figured out, but here are three ways of thinking about The Four Burners Theory. We outsource small aspects of our lives all the time. We buy fast food so we don’t have to cook. We go to the dry cleaners to save time on laundry. We visit the car repair shop so we don’t have to fix our own automobile. Outsourcing small portions of your life allows you to save time and spend it elsewhere. Can you apply the same idea to one quadrant of your life and free up time to focus on the other three burners? Work is the best example. For many people, work is the hottest burner on the stove. It is where they spend the most time and it is the last burner to get turned off. In theory, entrepreneurs and business owners can outsource the work burner. They do it by hiring employees. In my article on The 3 Stages of Failure, I covered Sam Carpenter’s story about building business systems that allowed him to work just two hours per week. He outsourced himself from the daily work of the business while still reaping the financial benefits. Parenting is another example. Working parents are often forced to “outsource” the family burner by dropping their children off at daycare or hiring a babysitter. Calling this outsourcing might seem unfair, but -- like the work example above -- parents are paying someone else to keep the burner running while they use their time elsewhere. The advantage of outsourcing is that you can keep the burner running without spending your time on it. Unfortunately, removing yourself from the equation is also a disadvantage. Most entrepreneurs, artists and creators I know would feel bored and without a sense of purpose if they had nothing to work on each day. Every parent I know would rather spend time with their children than drop them off at daycare. Outsourcing keeps the burner running, but is it running in a meaningful way? This line of questioning pulls your focus toward something positive (getting the most out of what you have available) rather than something negative (worrying about never having enough time). Furthermore, well-designed limitations can actually improve your performance. Of course, there are disadvantages as well. Embracing constraints means accepting that you are operating at less than your full potential. Yes, there are plenty of ways to “work smarter, not harder” but it is difficult to avoid the fact that where you spend your time matters. If you invested more time into your health or your relationships or your career, you would likely see improved results in that area. A third way to manage your four burners is by breaking your life into seasons. What if, instead of searching for perfect work-life balance at all times, you divided your life into seasons that focused on a particular area? The importance of your burners may change throughout life. When you are in your 20s or 30s and you don’t have children, it can be easier to get to the gym and chase career ambitions. The health and work burners are on full blast. A few years later, you might start a family and suddenly the health burner dips down to a slow simmer while your family burner gets more gas. Another decade passes and you might revive relationships with old friends or pursue that business idea you had been putting off. For the last five years, I have been in my entrepreneurship season. I built a successful business, but it came with costs. I turned my friends burner way down and my family burner is only running halfway. Work-Life Balance: Which Burners Have You Cut Off? 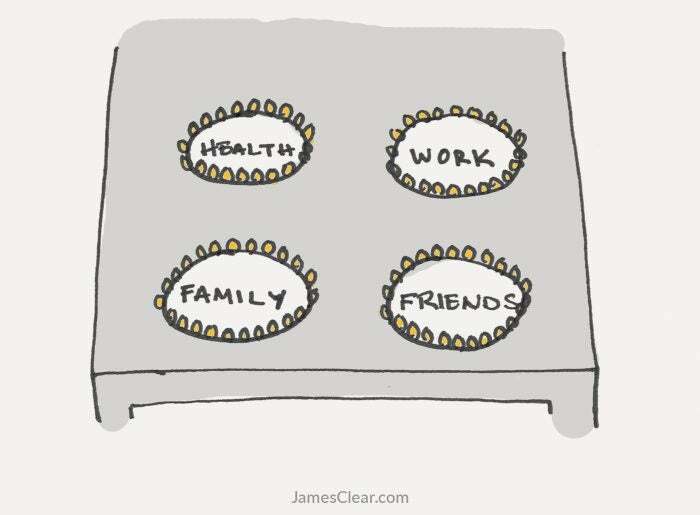 The Four Burners Theory reveals an inconsistency everyone must deal with: nobody likes being told they can’t have it all, but everyone has constraints on their time and energy. Every choice has a cost. Which burners have you cut off?